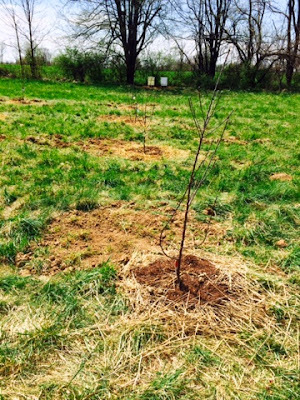 The remaining fruit trees got planted! I like seeing those hives in the background too. The beautiful day actually created some internal stress for me. We hadn't done kitchen cleanup since Ayden's ER visit and dishes were piled high. Maverick and Polly are both shedding in preparation for Summer so there was fur everywhere. I've also been half way done with switching out Ayden's clothes (my absolute LEAST favorite parental chore) for a couple of weeks now and that has been weighing on me. The stress came from being torn between being outside all day to enjoy the sunshine and staying inside to take care of the household stuff. I am not one to HAVE to have a clean house before any fun can be had but at the same time, if it reaches a certain point of disarray, it is hard for me to relax enough to have any fun and we were there... I also had a headache and was tired so even though my original plan was to knock some of it out during Ayden's nap, I decided to take a nap myself. When I woke up I felt much better physically but was even more stressed out mentally because Ayden was in no mood to entertain himself. Of course, it all worked out okay in the end. I ended up putting a movie in for Ayden and that was the ticket. I was able get all of the dishes washed and the vacuum run and even make a little more progress on the clothes swap process. I try to challenge myself to use movies as a last resort but I feel like some screen time is better for him than a mommy who wants to pull her hair out. 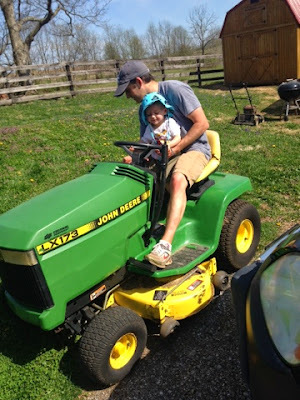 When David is home he usually takes Ayden outside or up to the playroom to play so I can get this type of work done; but he was out at our farm planting trees, spreading mulch around my bees and helping my mom with a couple of things at her house. Needless to say, he had a lot on his plate too and home was the safer place for Ayden than at a construction site so he stayed with me. As the construction on our new house picks up, David is going need to be even more involved with that (along with continuing to work full time) and I am just going to have to find more creative ways to take care of Ayden (and someday Logan too!) while also maintaining our current household on my own. I will have help from my and David's parents when I really need it and David would drop everything and help me if I really needed him; but I really want to try to keep the big picture in mind. 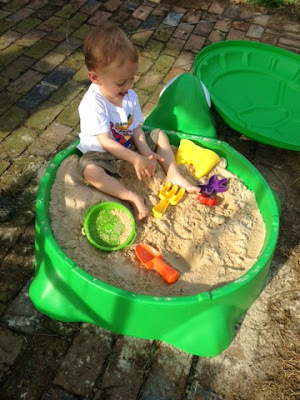 While we are going through this process of having a baby and building a house, things are going to get stressful. We just need to keep perspective, lower some expectations, let some things go and just enjoy everyday as much as we can. All of this is craziness will be temporary and TOTALLY worth it when it is all said and done. Our day ended on a really great note when we ate dinner outside together and then went for our last day at the YMCA before our membership ends. We went for a family swim in the warm water pool and had such a great time. It was what all of us needed after a kind of down type of day. Ayden was in a great mood all the way until bedtime and we enjoyed him so much!! Have you ever been torn between getting out on a beautiful day and staying in to get your house back in living order? Flashback! Here's what we were up to one year ago today: "Coughing Fits"
And two years ago today: "Feeling Better"
Life sometimes gets tough and you my friend have a LOT on yourp late right now. You are doing a fabulous job, just remember that!